Download Part of Lesson One! 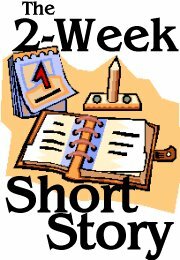 Do you have trouble planning, starting, or finishing short stories? Does it seem to take forever to get to the end of that first draft–if you ever do? If so, this affordable two-week, eight-session email course is for you. Designed to help you plan and write solid first draft stories in just two weeks, the eight lessons in this course will take you from the first idea brainstorming session all the way through the rough and rocky middle of your story, to deciding what type of ending is right and how to accomplish it. Through a variety of instructions, worksheets, checklists, and discussions, each lesson keeps you moving forward on your story at a steady pace. Just $1 per lesson to write a solid, fast first draft of your next story. Downloadable, printable lessons in .pdf format will arrive via email every other day over the course of the two weeks, beginning whenever you sign up. The course is structured to assist you in writing every day for the two-week period, keeping you motivated and providing methods for avoiding blocks and other writing pitfalls. Most stories get started but are never finished. By using the writing plan outlined in this course, however, you can finish every story that you start. Solid first drafts are the raw material every writer needs to work with. This course can help you complete one every time you start. Canadian writer Sherry D. Ramsey’s first writing love is speculative fiction, and her short fiction works have appeared in print and online. For the past twelve years she has been the Editor/Publisher of The Scriptorium, a monthly web magazine dedicated to offering a wide variety of resources to help writers start and maintain successful writing careers.